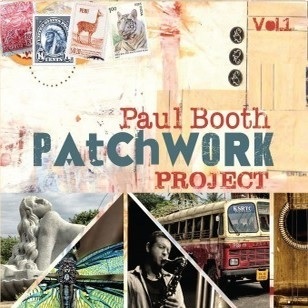 Back in 2013 saxophonist and multi-instrumentalist Paul Booth had an idea to record a new album that was stylistically outside of the music he had already released. Over the years he has been involved with many bands, playing music from various parts of the globe. He finally felt that it was time to branch out and explore and thought it would be inspiring to involve people from various backgrounds. Reaching out to fans, friends and colleagues on social media he asked for suggestions ranging from genre, instrumentation, songs, metaphors and ideas in an attempt to create something new. The result is what you hear on this new album Patchwork Project. Two years in making the album features many well known guest artists in large and small ensembles. As the title suggests, the music takes it’s influences from multiple genres including Jazz, Brazilian, Afro-Peruvian, Indian, Reggea, Celtic and more. He has found a unique way of seamlessly blending these styles in his compositions/arrangements and playing. Expect to hear heart-warming songs (co-written Australian vocalist Victoria Newton and Brian Hanlon) and instrumental melodies accompanied by eclectic world rhythms and the luscious tonality of the string quartet.